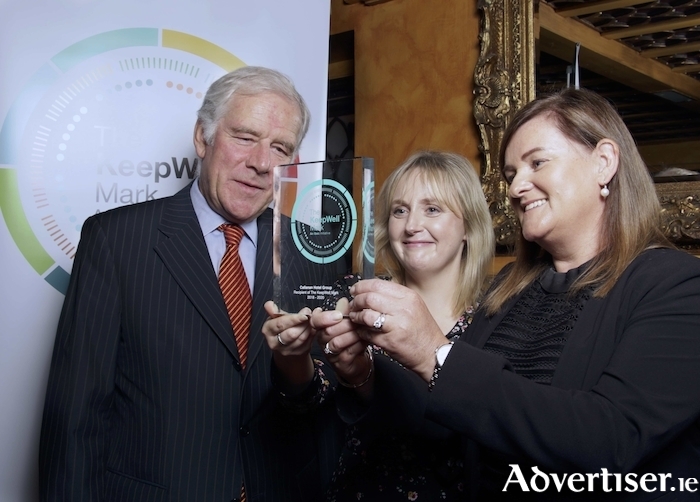 The Callanan Group, consisting of The Prince of Wales Hotel and Karma Nightclub in Athlone and the well-known Skeffington Arms and DNA Nightclub in Galway have become the very first hospitality company in Ireland to achieve the IBEC workplace wellness accreditation, the KeepWell Mark. Signing up to the KeepWell Mark initiative in January 2018, was part of a commitment by the company to provide the newest and highest standards of workplace wellness, health, and safety to all of its employees. The KeepWell Mark is an evidence-based accreditation and award that recognises Irish employers for investing in workplace health and wellbeing. Its aim is to help business benchmark workplace wellbeing activity through a set of systematic and methodical steps. The framework includes a self-assessment, an onsite assessment from an IBEC approved external assessor, and culminates with a report that outlines areas for improvement for each business. The accreditation takes a holistic approach, focusing on eight key areas and how they impact our business. These eight areas of improvement are leadership, absence management, smoke free, physical activity, health and safety, mental health, healthy eating, and intoxicants. To address the above, the different business took part in a number of different initiatives including nutritional talks, yoga and Pilates sessions, a 10 week get fit programme, lunch time walks, tag rugby tournament, mental health awareness talks, updated health and safety training, CPR courses and lots of other activities. Speaking on The KeepWell Mark process, HR Director Siobhán Howley and Group Operations Manager Ashling Dudley said it is becoming increasingly apparent that business leaders in Ireland need to make the health and wellbeing of their employees a top priority. Speaking on behalf of IBEC, John Brennan, IBEC Regional Director for West of Ireland said he was delighted to congratulate the Callanan Hotel Group who are the first organisation in the hospitality sector to be awarded Ireland’s national workplace wellbeing accreditation, the KeepWell Mark. “The Callanan Hotel Group have shown their commitment to enhancing staff health and wellbeing and have taken active steps in planning, design and delivery of an appropriate organisational staff wellbeing plan, to ensure these needs are addressed. Extremely well done to all at the organisation for their efforts in achieving the mark,” he said.